The Pelikan 4001 Historic bottled fountain pen ink is a special edition ink available only at special times or packed with Pelikan's special edition pens. 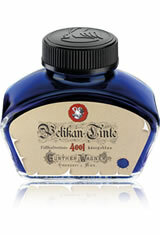 Pelikan has produced their 4001 fountain pen ink for over 100 years. This ink has been tried and tested and is a real classic fountain pen ink. Do not miss out on this Pelikan 4001 Historic bottled fountain pen ink when it is available. The Pelikan 4001 Historic Bottled Ink(60 ml) Fountain Pen Ink usually ships within 1 business day unless otherwise specified. Each Pelikan 4001 Historic Bottled Ink(60 ml) Fountain Pen Ink we sell is guaranteed to be genuine, authentic and will arrive brand new & unused! Used this ink in my Conklin Mark Twain Crescent. Smooth flow and beautiful blue color! Color is an unfortunate slightly-too-purple royal blue, that is not very saturated. It behaves quite well on most papers. The bottle design is to die for, and I love the artwork. A must collectable item if you are one of the ink collectors.